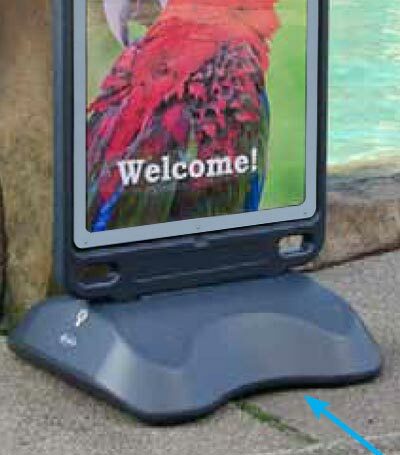 The Advocate floor standing poster display sign is a versatile way of advertising your products or service. 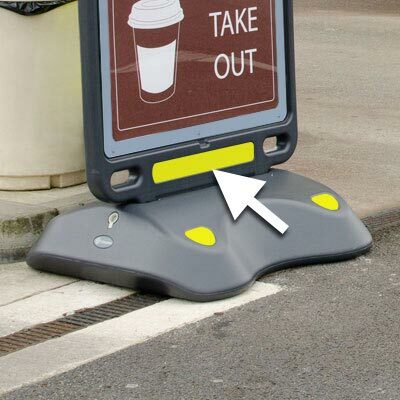 Ideal for pavements, forecourts, shops, restaurants and leisure environments. 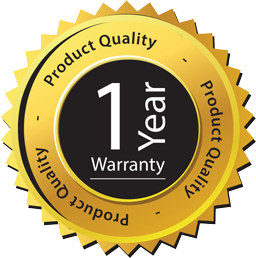 Discounts are available on quantities of 5 or more – please request a quote or contact our sales office. 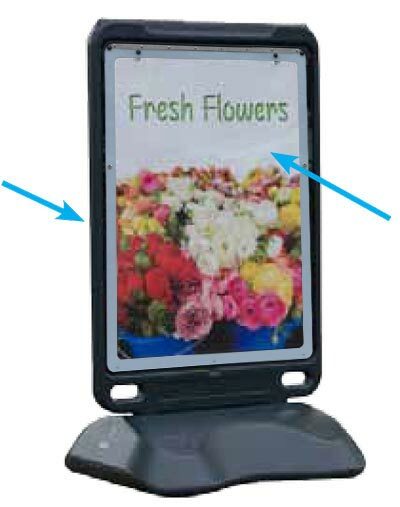 Display your advertising posters in style with this extremely robust, low maintenance and easy to use poster display sign designed to boost sales and promotions. Ideal for pavements, forecourts, shops, restaurants and leisure environments. This large floor standing display sign holds a 30(w) x 40(h) inch (762mm x 1016mm) poster or B1 sized (707mm x 1000mm) poster to give outstanding visual impact. The posters can easily be changed, providing a cost–effective way of advertising your products or service. Available as a single or double sided display sign. Advocate is manufactured from tough, corrosion resistant Durapol™ material, which offers exceptional strength and a long service life. Advocates two piece design allows for simple self–assembly and ease of delivery / storage before use. 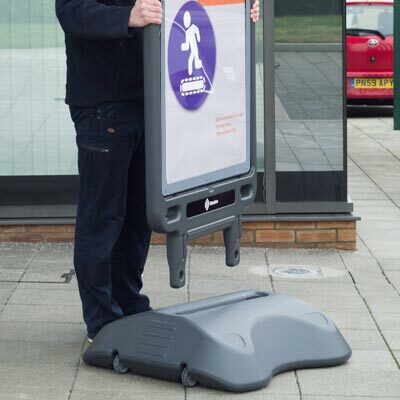 The pavement display sign has a slim design, making it easy to manoeuvre, allowing retailers to display their advertisements in the best position for each promotion. 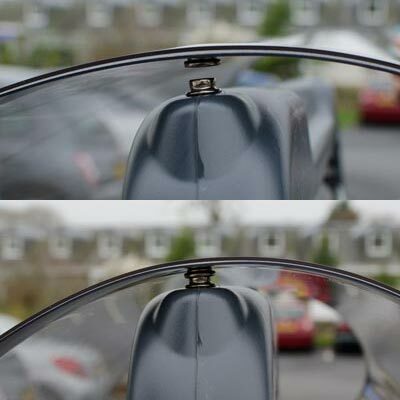 The large face is ideal for forecourts as passing drivers can still see the sign. The large curved ballast base provides stability and can be filled with water or sand to minimise the risk of the unit blowing over (the base must be ballasted with 77kg of sand / water, in order to withstand high wind speeds). The Advocate is also available as a wall mounted option – to coordinate with this floor-standing model. Large display area - spacious 30(w) x 40(h) inch (762mm x 1016mm) or B1 (707mm x 1000mm) poster maximises visual impact. Posters can be easily changed, providing a cost-effective way of advertising your products or promoting your company. Robust construction - manufactured from tough, corrosion resistant Durapol material, offering exceptional strength and a long service life. 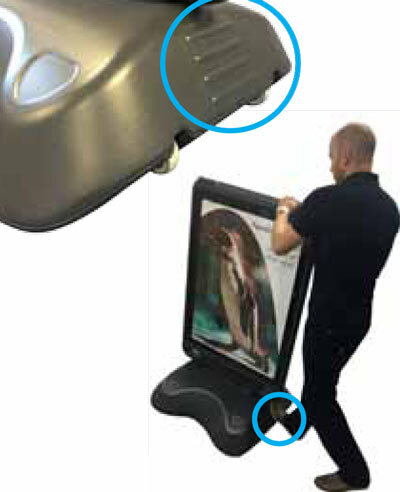 Security - magnets offer a strong all round fixing securing the poster in position. The magnets and gasket act as an effective seal helping minimise water ingress. Double or single sided display. Contemporary design to blend with many different indoor and outdoor environments. 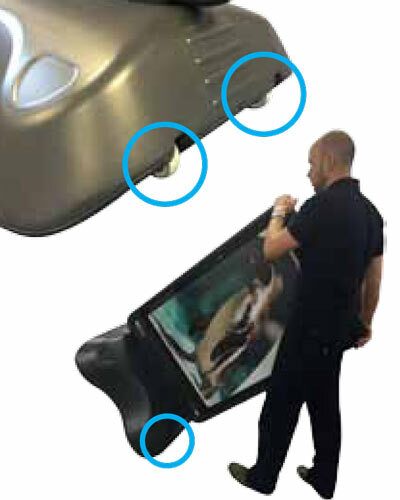 Press-studs on the top of the body holds the clear polycarbonate protector open to access the poster with two hands. This makes changing posters in bad weather quick and easy. 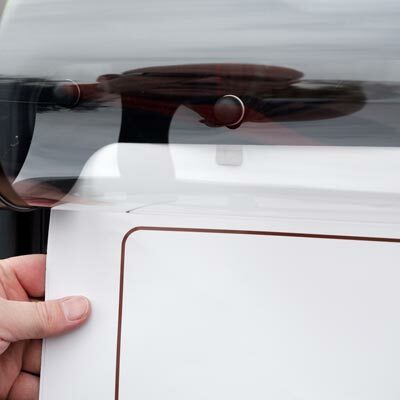 Stainless steel poster clips hold the poster in place before closing the clear polycarbonate protector. 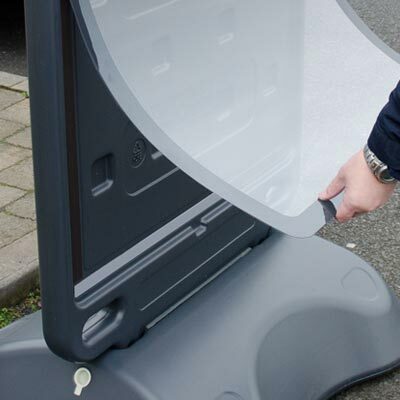 Clear polycarbonate protector offers protection to the poster from weather and graffiti and helps secure the poster in position. A clean and tidy display is created with the use of magnetic strips and metal clip to secure the posters in position (the metallic clip secures the B1 sized poster in place without using the magnetic strip). Strong and robust rubber wheels allow the unit to be manoeuvred when ballasted. 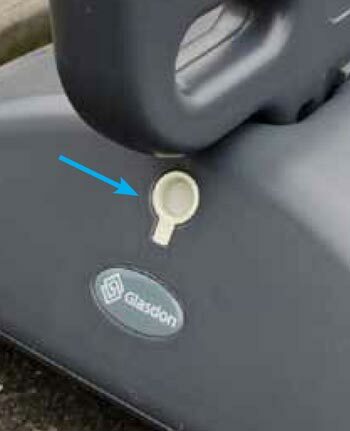 Foot rest detail provides an area to place your foot to ease manoeuvring. 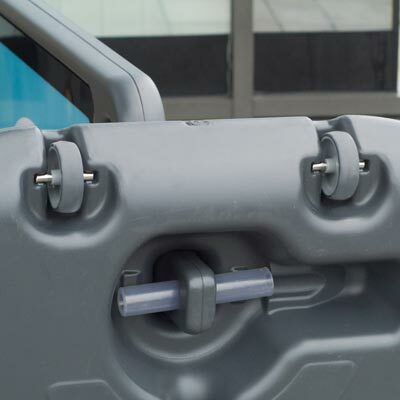 Two fixing points allow the unit to be fixed to a wall/post for maximum security. Ballasted base – must be filled with water or sand for maximum performance. Fill port and cap to ease filling of the base with water or sand. 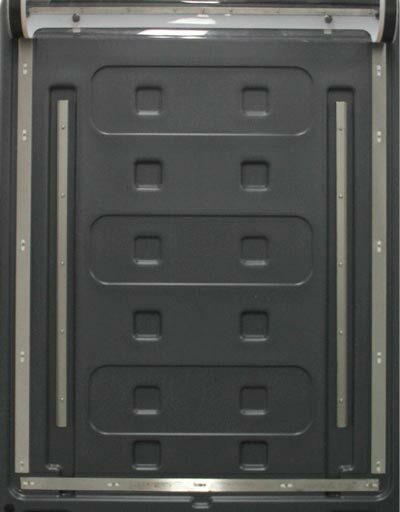 Large curved base – strong, robust and impact resistance, and has no sharp edges to reduce hazards. Two piece design (Body and Base) for simple self-assembly and ease of storage before use. Unique fixing method using nylon fixing pegs to secure the body to the base (patent pending). 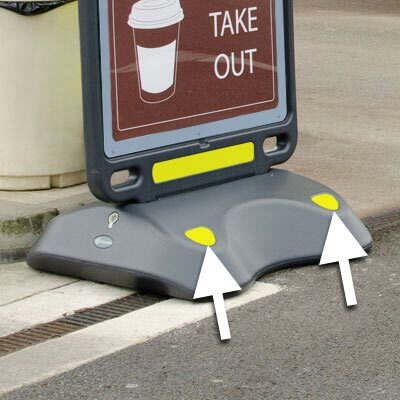 Recessed areas for reflectors or personalisation options, improving safety and reducing trip hazards. Note: When using a 30x40 inch poster, please allow a 20mm space on all four edges of the poster to ensure the printed border on the clear protector does not cover information. For the best visual on a B1 sized poster, please allow a 20mm space on only the top edge of the poster. Which products do I need for my petrol forecourt? 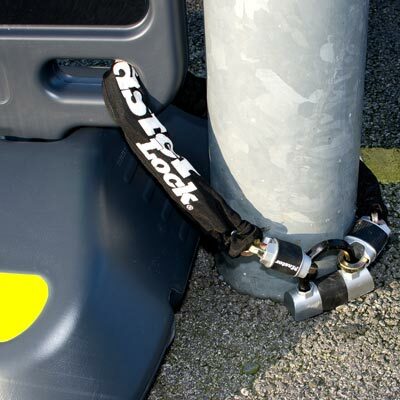 We answer your most frequently asked questions to help you choose the most suitable products for your petrol station forecourt and increase customer retention.